Kaisercraft Beyond The Page Small Tree Advent use your own creativity and embellishments to turn this tree-shaped advent calendar into a beautiful piece for your home or office. The MDF is a blank canvas waiting to be transformed and customized to match any decor. Use paints inks papers beads yarns or virtually any other crafty items you may have on hand. 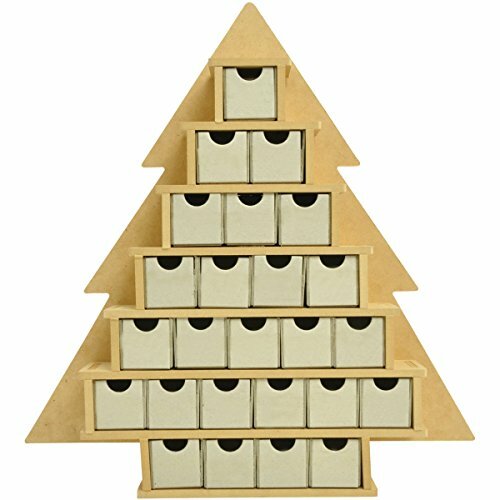 This package contains the pieces to make one 15-1/4x16x2 inch advent calendar. Each of the twenty-five drawers is made of chipboard and measures 1-1/2x1-1/2x2 inch. Assembly required flourishes and embellishments not included. It is an imported product.